This post has tips for people who are getting ready to take part in a table quiz. See How to organize a table quiz if you need to get ready to run a quiz yourself. So you have been invited to a table quiz, and you want to win the first prize - or at least not to make a fool of yourself. If you've never been to a quiz before, then knowing what typically happens at a quiz-night might be helpful. But remember that every quiz is different - read any publicity material that is available, and also arrive in plenty of time so you get a good seat where you can hear all the instructions. "Studying" for a table quiz is quite difficult, because the questions are often about general knowledge, so difficult to predict. But there some simple things which you can do, which can make a big difference on the night. Very often, quiz organisers look in the news for some very topical questions. So, by following the news, you stand a good chance of knowing the answers to some questions. Choose a local newspaper if you think that the quiz is very local, and / or a national or regional one if you think that the quiz organizers have a wider focus. 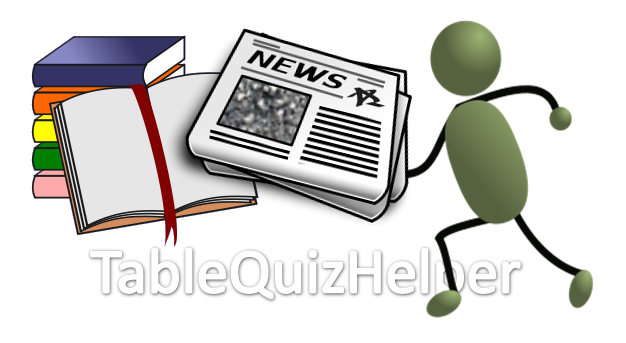 Find out about the organisation is running the quiz, or which will benefit from it. If the organisation has a website, then read it, focussing on the key facts and figures. For example, if the quiz is being run by the Red Cross, find out who founded the Red Cross, when, what their aims are, how many countries the operate in, etc. Read their Wikipedia page. Check their Facebook page, Twitter feed, Youtube channel, Instagram page - whatever. Google them, and see how they've been in the news recently. Find out who the nationally important people and local contact people are, and what services they offer. Find out about the subject area that the quiz organizers expect people to be interested in. If the quiz is being organized by a soccer club, find out about soccer: who's the most famous player at the moment, what is the most prestigeous competition in your country and who won it last year, what are the basic rules of the game, etc. Ditto other sports and activities. Refresh yourself about the basic facts-and-figures for your country: tallest mountain, largest lake, longest river, largest city, population, capital city, where does the Prime Minister live. If you have a local or neighbourhood newspaper, then read the last few editions. Remind yourself about this history of your town - when was it founded, what are the main industries, biggest employers, etc. Choosing your team members wisely can be as important as any other study or preparation that you do. You want to be with people who are reliable: ones who will turn up as agreed. They also need to be good listeners, able to focus on the questions that are actually being asked, and quick thinkers who can cope with rapid-fire questions about all sorts of topics. It's helpful is they work well in a team too. Make identify people who might be good team-mates, and invite them to be on your team. Get their commitment, and make sure they understand where and when you are going to meet: a team member who arrives on the wrong day is very little use. Swap phone number, and share transport if you can, so that you can start to work together as a team as early as possible. If you are really eager, you might even visit the venue beforehand, to find out what it's going to be like. Make sure that you get a good night's sleep the evening before the quiz. Plan your timetable for the day: what will you wear, what time will you have dinner, do you need to pick up the baby-sitter, how to get there, and how long will it take to get to the location and find a car-park. Check in with your team-mates as soon as you arrive as the venue where the quiz is being help. After you have registered, work together to get a good seat, and to get any refreshments that are available. Find out where the toilets and the emergency exits are. Decide who will be the "scribe" for your team, ie the person who writes the answers down: you need someone with tidy handwriting for this task, so that the markers can understand your answers. Choose a team-name, and write it on all your answer sheets: it's easiest to do now, rather than doing it between rounds.